As a family-run business in Indiana, Gulf Stream Coach is centered around family. From their talented craftsmen to their management, the importance of family isn’t an afterthought. Employing their core values of “quality, value, and innovation”, Gulf Stream Coach works to build RV’s with families in mind. Those values have led the company to take a spot as one of the industry’s leading family-run businesses. With a powerful website, GulfStreamCoach.com, the company can provide even more value to their customers. 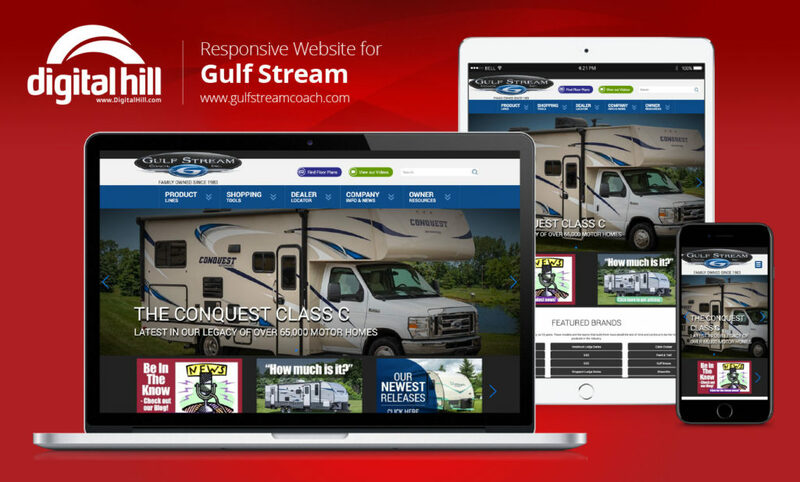 Designed by Digital Hill, Gulf Stream Coach’s new website is built with the company and its users in mind. The company’s offerings are represented on the home page. New to RV’s? The gallery on the home page provides an introduction to the kinds of RV’s available. Whether it’s exploring the country in a motor home or hauling cargo with a toy hauler, there is something for everyone. The to-the-point layout and attractive design of the site helps Gulf Stream complete its mission of connecting families with the right RVs and trailers. The beauty of the new website goes beyond just design. 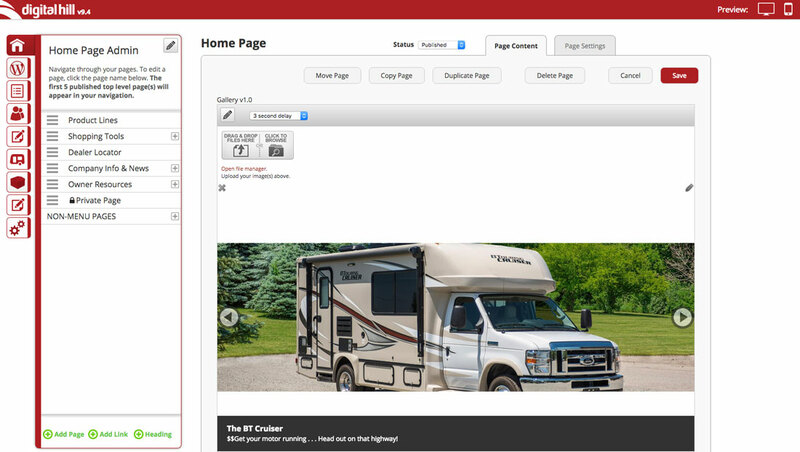 It is user-friendly for both site visitors and RV owners. Gulf Stream Coach carries over a dozen brands while managing several product lines. Trying to keep all of it organized can easily lead to dated information and a jumble of a site. Not with a Content Management System, however. With the CMS provided by Digital Hill, site owners have total control over site content and an organized, simple interface with which to interact with content. How does it work? A CMS is a back-end system that allows users to alter site content as they see fit. For a business that has over a hundred RV models and dealerships in 2 countries, the ability to stay current allows it to provide the quality their customers deserve. Need to remove a defunct product model or update the price? Is there a new job opening? Has a new dealer opened? Maybe there’s news to share! The company can now stay on top of its content and exercise control without fancy code or a dedicated content manager. Whether it’s a family looking for an RV to start their next road trip adventure or just a casual visitor, the new site is easy to navigate. Starting at the home page, the website is laid out so that all the relevant links are easy to locate. At the navigation bar, you can search the products available, find out more about Gulf Stream, or dive in and start searching for dealers near you! If you happen to be a regular, you can scroll down and check out the latest company news. Still can’t find what you’re looking for? The search bar at the top extends your search capability and helps dig through the site pages to find what you need. Since 1983, Gulf Stream Coach has produced quality motorhomes, RVs, and trailers for families across the nation. Their new website allows them to connect with even more families. 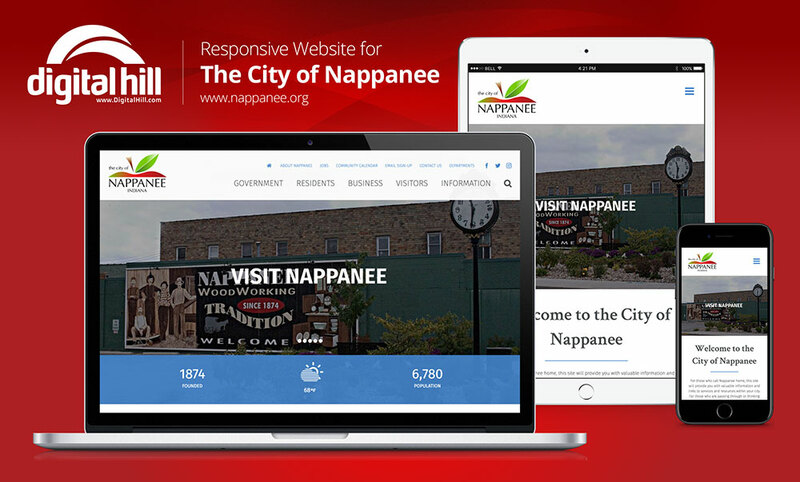 Need a website for your business? Check us out.